Yushu was devastatated on April 13 by a 6.9 Magnitude earthquake. More than 3000 people lost their life. Dangerous shallow earthquake near a lot of villages. Click here for a detailed report. Very deep in the earth’s mantle. No problem. Moderate earthquake in the wilderness area of north-eastern Peru. Look on the sattelite image to the Rio Huallago, one of the feeding rivers of the Amazon river. Moderate seaquake in the subduction zone of the islands in front of Sumatra. Moderate earthquake under the Sakhalin island. Sakhalin belongs to Russia but was also claimed by Japan. Sakhalin might be known by older people for the shooting down by the Russians of a Korean Air flight 007.Korean Air Flight 007, a South Korean civilian airliner, flew over Sakhalin and was shot down just west of Sakhalin island near the smaller Moneron Island by the Soviet Union on 1 September 1983 who claimed it was a spy plane. All 269 passengers and crew died, including a U.S. Congressman, Larry McDonald. Deep earthquake on a location where in the far future new islands will be born. Especially look at the many beatifully shaped volcano mountains under the water level. Beautiful example of a volcano arc. Moderate earthquake under a farming area and near Peristerion (population 137,659). 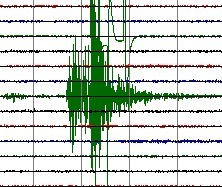 Part of a number of aftershocks around the island of Simeulue, tectonically very active. Epicenter near the shores.